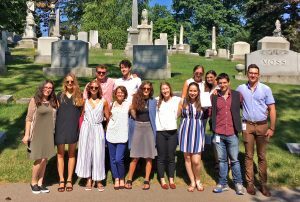 Therese Mayer Workum, Dr. Jacob Rader Marcus, Rabbi Max Lilienthal, Rabbi Isaac Mayer Wise, Harris K. Weston – As Workum Summer Interns visited JCGC’s Walnut Hills Cemetery on July 25, 2018, they walked among some of the luminaries of our community, whose legacies involve the very Jewish agencies where they were working! JCGC hosted its first Workum Intern ever this summer. The college students participating in the program are either from Cincinnati or studying at local universities and are paired with local Jewish community agencies and congregations. The summer internship program has been funded by The Workum Fund for over twenty years and is operated today in partnership with JVS Career Services and Cincy Internships. JCGC’s Workum Intern was Eva Rosenthal – a Cincinnati native, graduate of Walnut Hills High School, and current Religion major at Denison University, where she also serves as President of the Denison Hillel chapter. Eva was excited to be back in Cincinnati for the summer and connecting to the Jewish community. Her internship responsibilities included genealogy and historical research and writing, primarily helping to incorporate the Spanish Hebrew Society records into JCGC. The history of the Spanish Hebrew Society Cemetery that Eva wrote can be found here. Every Workum Intern hosts a site visit for all the other interns and prepares a presentation on their agency and their work responsibilities. Eva’s presentation started with a scavenger hunt of sorts, as she assigned interns to locate different Jewish symbols found on tombstones, such as the hands of a Cohen, the water pitcher for a Levite, or the candlesticks often placed to symbolize a pious woman. Eva then led the interns on a tour of the Walnut Hills Cemetery. 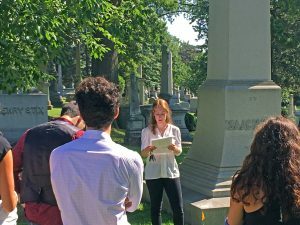 The tour was especially meaningful, as individuals integral to the founding and history of many of the community’s agencies and congregations are buried in the Walnut Hills Cemetery. Eva concluded the visit with a presentation on JCGC and her research. In addition to her Spanish Hebrew Society research, Eva unearthed donor plaques from several of our cemeteries’ chapels, which were removed years ago, and logged the donors’ names. 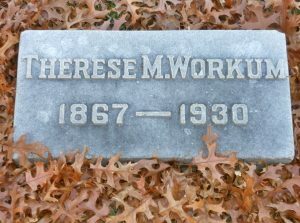 Eva visited the cemeteries and was also exposed to the workings of our office, helping to field calls from family members and from Weil Funeral Home. JCGC was very pleased to participate in the program and to have had such an amazing intern! It is important that we share the rich history of our community and the sacred work that we perform with the next generation!